Question of the Week: – What’s your current favorite hand cream? Answer:- Hand Cream is one of those boring but necessary items if you abuse your cuticles as much as I do. My favourite hasn’t changed over the past twelve or so months and I’m still loving the All for Eve Hand Cream by Urban Retreat. It’s rich but non-greasy and does the job without making me sell a kidney to pay for it. I wouldn’t usually link to Ocado (oh, the glamour!) but a google search revealed that’s it’s currently on sale there for £4.50, that’s 40% off if you happen to be doing your food shop online this weekend! On with the links! 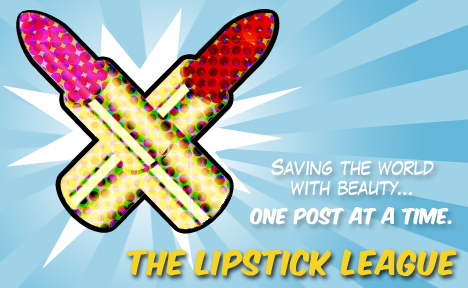 Check out the last entry for a new Lipstick League feature, the choice of which (I’m honoured to say) fell to me this week! Lipglossiping – finds her new ‘darling’ in the form of Darling Diva’s Space Beetle Nail Polish. Nouveau Cheap – Can a $1 eyeshadow from the dollar store really deliver bold color and pigmentation…even without primer? Come find out! Pink Sith – has pretty pink nails of steel thanks to the peptide infused nail lacquers from Dermelect Cosmeceuticals. Prime Beauty – says all tinted moistuizers are NOT created equal. Keep from having a makeup meltdown this summer with NARS Radiant Tinted Moisturizer SPF 30. Vampy Varnish – Kinda digs the new Benefit Ultra Plush Glosses. we heart this – Are you one of the many that have pondered whether RevitaLash really works? See for yourself with the we heart this review complete with Before and After Photographs! Beauty Junkies Unite – Did you know that Benefit is launching 6 new ULTRA PLUSH lip glosses next month that correspond with their famous box o’ blushes? See the review, swatches, and comparisons of CORALista, Dallas, and Sugarbomb! EauMG – It’s officially summer! And if you’re looking for a new summer fragrance to add to your wardrobe, you may be interested in this one by Atelier Cologne. Gouldylox Reviews – discovers the Good, the Bad and the Wet. Or really, just the good and the wet. [br] Have a great weekend everyone! Have you tried the Garnier Intensive 7 Days handcreams? They’re only about £2.99 (think I got mine on offer for £1.99), but they are amazing – hands feel soft and smooth even after handwashing!